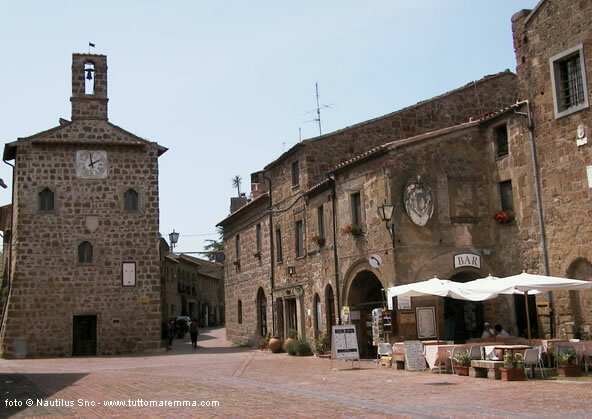 Sovana: a travel guide to the village of Sovana, hotels, farm holidays, accomodation, photo gallery. Sovana is a little village in the Maremma region, located on a spur of tuff, still preserving its ancient medieval aspect. The origins of Sovana (formerly Suana) date back to very ancient times. The presence of many remarkable monuments and vestiges of the past is evidence of the ancient splendours of the Etruscans, of the Papal State and of the Aldobrandeschi family. The first built-up area dates back to the Bronze Age, later on in VII century BC. it became an Etruscan town, in IV century AD it was an Episcopal See and in 935 it became the county seat of the Aldobrandeschi family. In addition, Sovana is well known for being the birthplace of Ildebrando, who became Pope Gregorio VII in 1073. As said above, in the actual urban structure, medieval architecture prevails: the square with the historic buildings of Pretorio and of the Archivio, the Santa Maria Church and the Cathedral, gives the place a very fascinating. Throughout the area below the village, most ruins are Etruscan, such as the cave architectures, the rock-cut passages known as "vie cave", the necropolises with different type of graves, among which the monumental tomb of Ildebranda of III century BC is worthy of note.